Chain bracelets and necklaces are easy to make; there are ready made chains that are available at craft stores and all you have to do is attach some charms, a clasp and you’re done. But it would be more exciting if you’re going to make and customize your own chain. Today, we’re gonna be learning 3 different ways how to make a component that you can link to create a chain, which you can then use for making a necklace and in this tutorial, a bracelet. 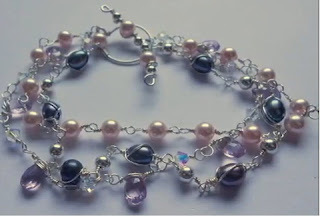 Rachel Murgatroyd, originally from England created the Triple Chain Bracelet in a 4-Part video tutorial. 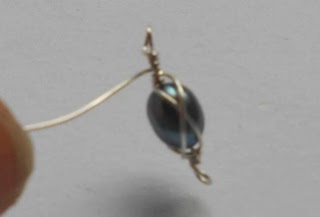 Using an 18ga wire, spiraling over 3mm and 5mm round beads while stringed onto the wire you can create a variation of a regular beaded T-bar clasp where beads are plainly stringed onto the wire. This is the basic way how to create a bead component that you can use for linking to create a chain. 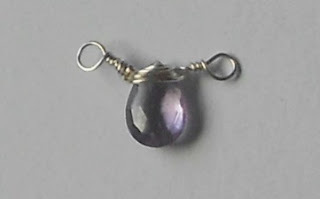 This is where you will learn how to incorporate briolettes and instead of using a head pin to make briolette dangles that you can attach onto the chain, you will make components by wire wrapping and making loops at both ends that you can use to link. With this part you’ll learn another variation, of a beaded chain. You will incorporate caged bead into the bracelet and make links, similar to your regular beaded chain. You can use the techniques you will learn and create the chains separately, but you can also use all three like what Rachel Murgatroyd showed on her videos.